Diamond Deal Classic Slot Guide & Review - Casino Answers! 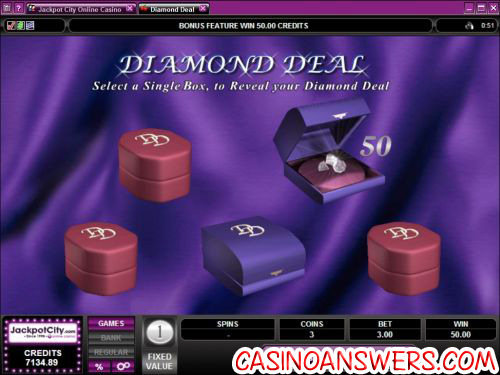 Diamond Deal is a 3-reel, 1-line classic slot machine developed by Microgaming, featuring wild symbols and a bonus game. You can play the Diamond Deal classic slot game at Ladbrokes Casino and Lucky Emperor Casino. 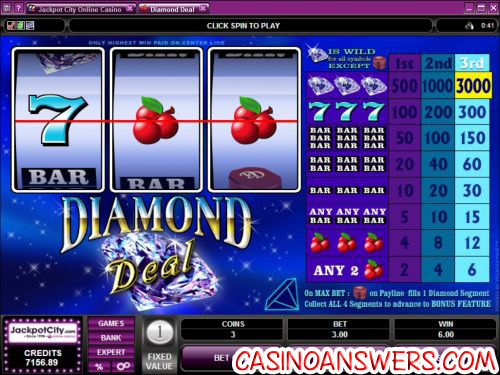 Diamond Deal is a fixed coin value slot machine, so the only coin available is $1. You can bet up to three coins by using the “Bet One” and “Bet Max” buttons. We strongly recommend you play the $3 maximum bet when playing the Diamond Deal slot machine, not only because the top jackpot is much higher on the maximum bet, but also due to the fact that the bonus feature is only available on max bet spins. Use the “Spin” button to spin the reels on Diamond Deal. Payouts on the Diamond Deal slot machine are as follows (1/2/3 coin payouts in parenthesis): any 2 Cherry symbols (2/4/6), 3 Cherry symbols (4/8/12), any 3 Bar symbols (5/10/15), 3 Single Bar symbols (10/20/30), 3 Double Bar symbols (20/40/60), 3 Triple Bar symbols (50/100/150), 3 Seven symbols (100/200/300), 3 Diamond Symbols (500/1000/3000). Use the “Expert” button to access the autoplay feature on Diamond Deal. Here you can set the spin settings including the number of spins (5, 10, 25, 50, 100, 250 or 500) and number of seconds between spins (0, 0.25, 0.50, 0.80 or 1.50). You can also set the stop settings, which are: stop once all spins are complete, stop when jackpot is won, stop if a win exceeds or equals (up to $2500), stop on any win, stop on bonus feature and stop if credits increase/decrease by (up to $2500). You can cancel autoplay at any time. Diamond Deal is a real gem of a classic slot. Not only do you get the simplicity of a reel slot machine, but you get a bonus feature to go along with it. If you’re looking for an online casino to play Diamond Deal at, you can get a 100% up to £100 signup bonus at Ladbrokes Casino! Are USA players able to play the Diamond Deal slot for real money? Unfortunately, USA players are out of luck when it comes to playing for real money at Microgaming online casinos. If you’re looking for a USA-friendly diamond-themed slot, try reading our Diamond Mine Slot Machine Review, Diamond Mine Deluxe Slot Machine Review and Super Diamond Mine Video Slot Review. How do I activate the bonus game in Diamond Deal? To trigger Diamond Deal’s bonus feature, you must make sure you are making the 3-coin maximum bet on each spin in the game. Then, you must collect four jewellery box symbols before you will be able to play the Diamond Deal bonus game. How come I can’t change the coin size in the Diamond Deal slot game? Diamond Deal is a fixed value slot machine, meaning all spins must cost $1, $2 or $3 per spin (or 1, 2 and 3 units of your selected currency). If you would rather play a slot machine where you can choose the coin value, please read our Cash Crazy Slot Machine Review. Where can I play the Diamond Deal classic slot machine?